What is a step through? Are you unable to stand in the tub to shower? Or unable to lower yourself or loved one to the floor of the tub? Our removable bathtub seat makes bathing safer and as a result may be a great option for you. 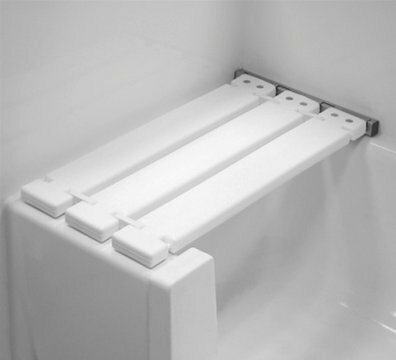 Several benefits are associated with the use of removable bathtub seats. Most of all, you can reduce tension connected with bathing due to the fear of falling. You can also provide a safe option for those who have trouble standing and reduce mobility and balance issues from standing on a wet surface. Furthermore, you can eliminate the need to lift bathers into and out of the tub which can be uncomfortable for both the individual and caregiver. Along with a patented design that meets ADA requirements, this removable bathtub seat is also easy to install. In addition, you can remove the seat when not in use. Once mounted, the frame does not move. There are 3 metal pieces (one at the end of each plank) that fit into the tub seat frame and easily pop out for removal. Then simply fold the three planks on top of each other for storage. The removable bathtub seat is a great compliment to our step through tub insert and other bathroom safety products or it can be purchased separately and installed on its own. Please visit our online store to purchase a removable bathtub seat or call us with any additional questions today. Click Here for Pricing and to Buy!